The Greenstar 9i is a boiler made by Worcester Bosch. 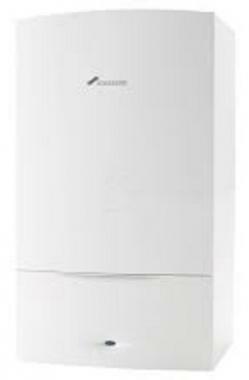 This boiler is a system gas wall mounted model, a perfect unit for people with smaller or medium sized homes. This boiler has been designed with reliability in mind. It comes with many ways to make it the most efficient boiler as well as coming with lots of different accessories and advantages. The Greenstar i is a highly efficient boiler with an output of 9kW and an efficiency rating of 93%, making it an A rated boiler. This condensing unit is compatible with Worcester Bosch Greenstore cylinders for higher efficiency as well as making your home complete with a Worcester system solution. As well as this the boiler can be used in conjunction with Greenskies solar panels. This boiler is easy to use with simple controls, clear information displays, a wide range of control choices, and a low energy pump which helps to reduce your electrical usage. The Greenstar i comes with ways to protect itself from any sort of damage thanks to its large condensesure style siphon that is built in as standard, eliminating the risk of frost if installed in a loft or garage. With it being a compact boiler it is able to fit into a standard sized cupboard meaning it's perfect to be hidden away out of sight and out of mind. It also comes with five years warranty so you can be sure you have a reliable boiler.